Is it me? Is it my corset? Is it fate? What am I doing wrong? 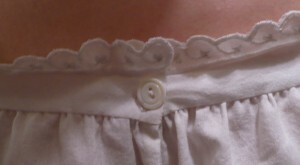 After only three more wearings, my (relatively) new chemise has another tiny tear. It’s still just a little teeny rip — too small even to patch. 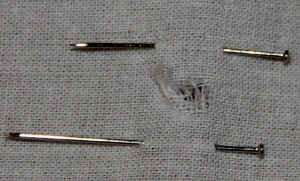 I think I’ll try darning it this time. I suppose I should be glad I caught it so early. 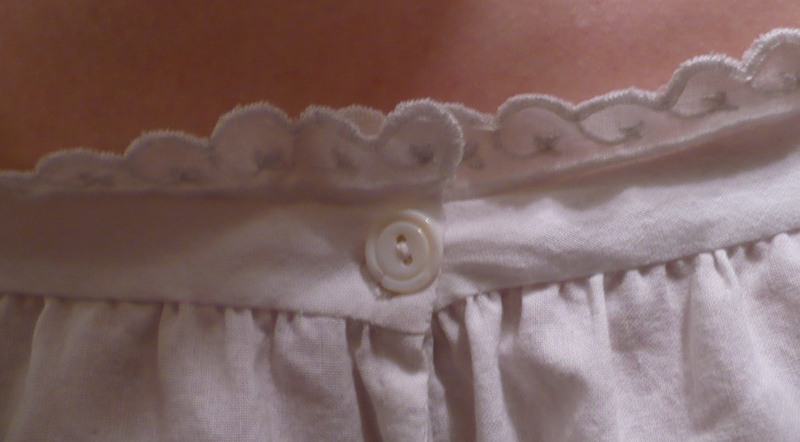 I only noticed because I decided to iron the chemise after its recent washing. 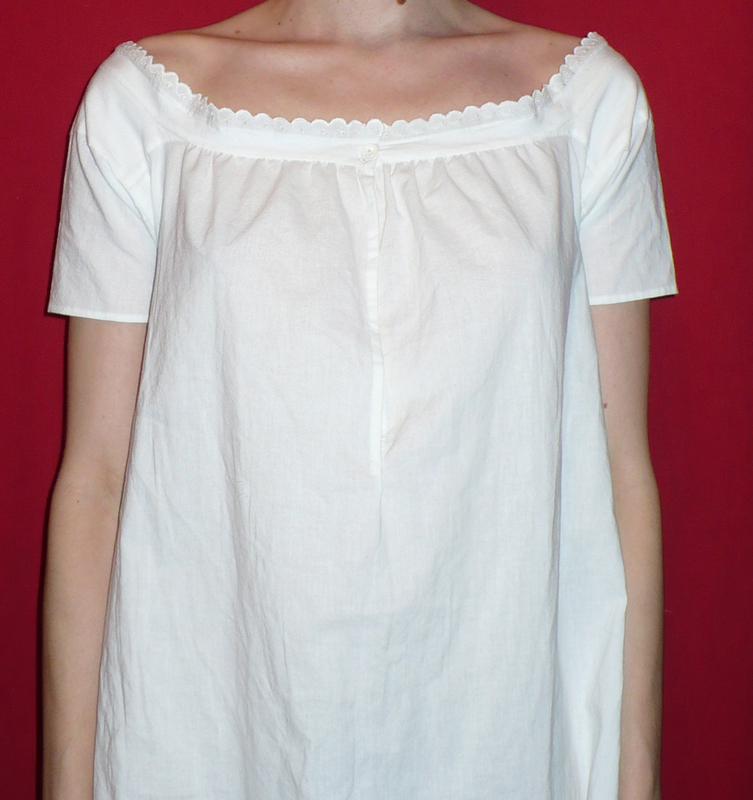 This garment, my first (and only, to date) 1850s shift, aka chemise*, is a bit of a jumble. It looks fine from a distance, but the fact is I alternated between 5 different sets of directions, which occasionally contradicted each other outright. There were also a few spots (mostly around the neckline) that every set of directions glossed over, so I simply guessed. 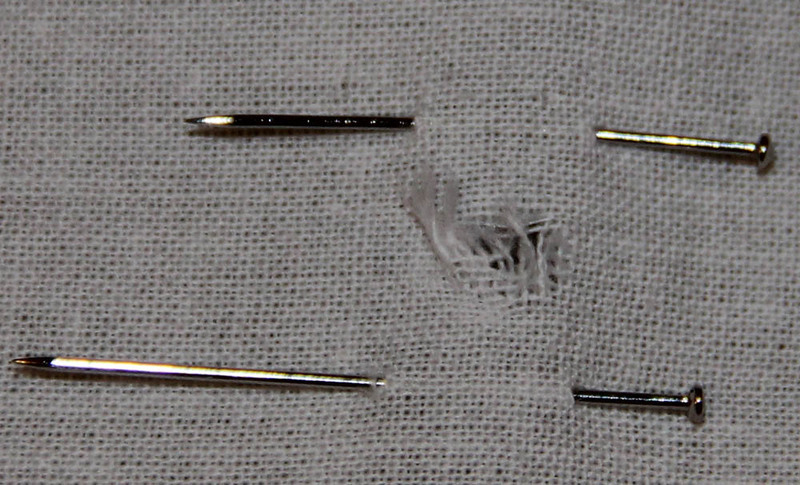 I need to start visiting costume collections to look at extant garments to see all those little details! The 1850s was a time of change for most female undergarments, many of which had remained stable in shape for decades previously. Last summer I made a shift from the 1838 Workwoman’s Guide. It was much more simply cut than this one, and ended up being enormous because I made it according to one of the larger sizes given. I gave it away to a photographer for use as a prop. I do plan to experiment some more with the Workwoman’s Guide patterns (and will probably give away the results), until I get the sizing right. Even though the shape they take is old fashioned compared to illustrations in 1850s magazines, it’s still very much acceptable for the period. Makes sense, since many of the women who were sewing shifts in the 1850s had learned to make them a decade earlier. As you’ve probably guessed by my previously stated predilections, this shift is entirely hand sewn. I embroidered the scalloped band, based on the simplest pattern I could find in Godey’s. *Like the shape of the shift, the name also changed in the 1850s. 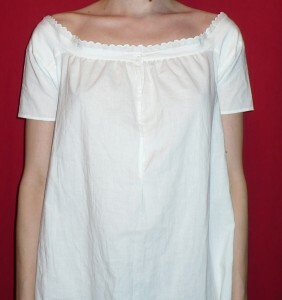 By the end of the decade most people in America and England had adopted the French moniker Chemise.